By Presidential Proclamation, October is National Disability Employment Awareness Month (NDEAM). Put your party shoes on because this national campaign celebrates the many and varied contributions of America’s workers with disabilities. Okay now take your party shoes off and listen up because NDEAM also raises awareness about disability employment issues that continue even as we speak. I mean as I speak. I mean as I write and you read. 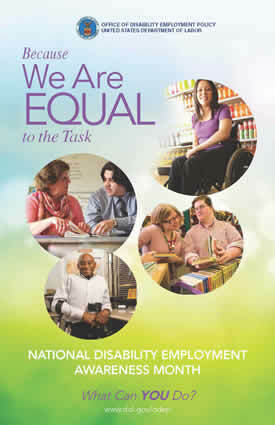 Appropriately, the theme for 2013 is “Because We Are EQUAL to the Task.” And here’s your first task: spread the word. You could start by sprucing up the décor around town with NDEAM Posters. Or if tape and paper is too old school for you, then post about NDEAM on Facebook, LinkedIn, and Twitter. And while you’re at it, leave a NDEAM link trail wherever you go. Look – here’s one: http://www.dol.gov/odep/topics/ndeam/. And wait, what’s this? It’s another link with great ideas on how to get people to think about equal employment! http://www.dol.gov/dol/media/photos/slideshows/20131001-NDEAM.htm. But you can’t be promoting NDEAM’s message if your own company isn’t up to scratch when it comes to disability awareness. 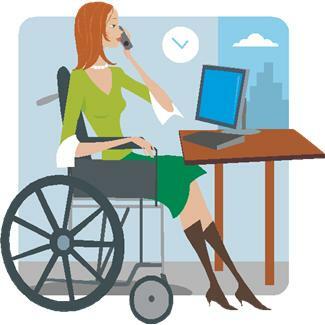 So use October to review company policies, train supervisors, and educate employees about fostering a workplace culture inclusive of people with disabilities. 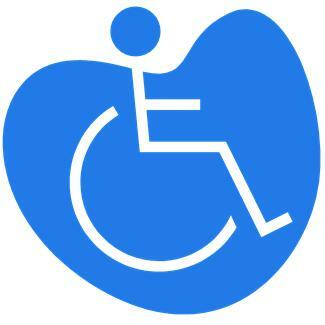 National Disability Employment Awareness Month is above all a reminder to work together and appreciate everyone’s differences – ahem, members of the House of Representatives. When that happens, there’s no task that we’re not equal to.